Ohhh, I am not a fan of these pictures! I may have to try another angle next week...one that's not so wide!! Total Weight Gain/Loss: As of my appointment last week, I've gained 13 pounds..yikes! 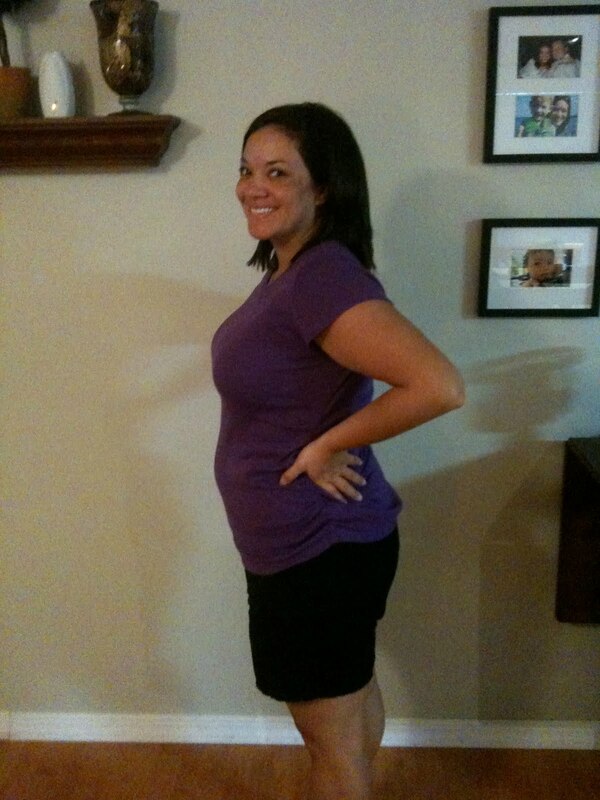 Maternity Clothes: Other than scrubs, all my clothes are maternity. Best Moment this week: Hearing his heartbeat at my appointment and finding out that all of my screenings have been normal. And my engagement ring fit yesterday...yay! Movement: Nothing definite. I think I felt a kick yesterday, but I can't be sure. Food Craving: No real cravings. I mostly want something after I've read about it or seen it on TV. Although I have been wanting PF Changs and we're going there tomorrow for date night! Sleep: Sleeping better, with the occasional night where I'm up late or have trouble falling asleep. What I am looking forward to: Feeling him kick and having my 20 week ultrasound on Thursday. We're praying everything looks great. Symptoms: Some back pain and occasional swelling of my feet. Overall I'm feeling pretty great! I'm so excited and thankful that we've made it this far without any complications or worries. It's been fun at work since there are so many girls who are pregnant. We definitely have a lot to talk about!